In July of 2015, I w ent into the Nevada State Museum in Carson City to see the work of Dat So La Lee. She is a famous Washoe basket maker who lived from about 1835 to 1925 and is often hailed as the finest basket maker of all time. Her work is flawless and required a particularly gifted mathematical mind in order to produce the patterns for which she is justly famous. Although Dat So La Lee’s baskets are generally not available for public viewing, I convinced the museum’s curator to let me see their collection of her work after explaining that I am a basket maker and would like an opportunity to admire her work. I followed the curator down the hall, to a stairwell, and down to the basement. We walked along another hall and soon stood in front of a door-sized vault, the kind you see in banks. He dialed the combination and turned the wheel. We entered a large temperature-controlled room. The room was full of baskets. From top to bottom, with rolling wire racks bursting, there was every imaginable shape, size, type, and color of basket. Along many walls, there were locked, glass-covered cases, also full of baskets. I felt as though I was walking into a treasure trove. My guide put on latex gloves and opened the case to our left. He slid out the drawers, so I could view piece after piece of basket treasure. He carefully picked up one of Dat So La Lee’s baskets, and then methodically, in a warm and generous voice, began explaining her baskets are considered the best. He revealed the mathematical planning required to make her intricate designs. The curator told me about the processes involved in sizing and preparing willow for weaving. It was a revelation and an education. He gave me a framework from which to appreciate the quality of Dat Sol La Lee’s weaving much more deeply than I had previously understood. As we progressed though the shelves, he gently manipulated various baskets to explain the differences between two-rod work and three-rod work. He told me how colors were introduced and explained the various materials in these high-quality baskets. It inspired me to stretch out and improve my craftsmanship. Each basket captured yet another variation in design. Each basket embodied personality, pattern, and evoked a response in me. We spent over an hour viewing the varied and interesting baskets in the room. The curator took his time. He was generous and knowledgeable. The time flew by. 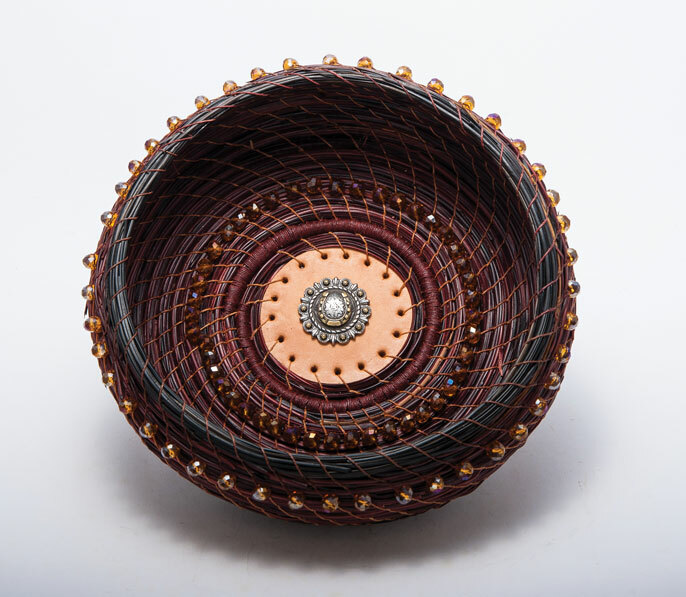 Lauralee Northcott’s baskets are on display at the Winthrop Gallery. LOCATION: The Winthrop Gallery, 237 Riverside in downtown Winthrop. HOURS: September, daily 10am to 5pm; October Thursday through Monday. INFO/CONTACT: 509-996-3925, www.winthropgallery.com.